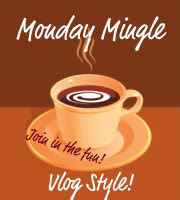 Welcome again to Monday Mingle. I can't access my blog once again, but like before I can sign into the dashboard and post, but when I click view blog, it shows that I'm not signed in. I can comment on blogs with disqus but not with the regular blogger comment embedded form which bites. So I'll come by again. I swear blogger or google or FF , whichever is crawling up my back lately. Oh well. I'll just do what I can with what I have. You'll pardon the sweaty look. I was all over the house doing chores etc and wrangling kids. Monday Mingle: 9/14 - Faves and crushes from Colette S on Vimeo. Looking forward to seeing you gals! I love your Monday Mingles! You are so cute! :-) I think im gonna try this out for next week! Yes yes you should come join in. It would be lovely to see you! I have the questions for next week on my mingle for today and you can always submit your own questions to Jennifer on her blog! I'm not sure what the deal is, but I can't see your video :(. Just a blank white box. Your blog looks great! You did a wonderful job with the makeover. I have no idea why you can't see the video. Hopefully it doesn't keep happening. I love when you visit with me busy woman. Thank you. Go enjoy your week live. You sure picked great movies! Shawshank Redemption is one of my very, very favorites! Your kids were cracking me up in the background with their wiggles and nonsense. We do netflix and I'm thinking I need to purchase my fave movies when I can before they get too expensive to consider. I hijacked their room lol I'm surprised they behaved and wasn't all over me and the camera! You love the drama's! I absolutely love those three movies too. When you said "Morgan Freemans voice" and sighed the way you did, I laughed so hard. Men with accents make me swoon too! Oh the giggles in the end were so addicting, your family (and you) and beautiful! I loved your video! It felt like I got to meet you. I am sad to say I have only seen one of those movies! Shawshank Redemption. It is a favorite of mine too. I want to join in next time. Looks like so much fun. How do you record and post your video?? I need to figure that out first. I'm so glad you want to join up. ok here goes and you can ask me any questions you wish. 1. make a video of you answering the questions on eightymphmom's blog. you can answer any or all of the questions, you choose. 2. You can use your camera to record you. I put mine on a box and sat in front of it :) or you can use your webcam to record. Or even your cellphone! 3. you can write your post and then upload your video using blogger or make an account with You Tube and upload to Youtube and then embed in blogger. Or you can make a profile (all free) with vimeo and upload your video there and then embed in blogger. 4. finish your post and grab the Monday Mingle button and head over to Jennifer's blog and add your post to the linky so that we can come visit with you. I think we video on Sundays now so that we can be on time for Monday lol because we used to run into Tuesday! And you can visit the other vloggers and get to know them etc. and I think that's it! It's ok to be goofy or serious or funny or bring your pet or kids. It's fun. It was so fun to hear about your favorite movies - you made excellent choices - those are really good movies! Your kids are adorable - it is so fun to see them. Yes football season is big here (my hubby) too - ugh. I don't mind it too much, but he does kind of get really involved in it LOL. Thanks for mingling and have a great week! I love each of those movies as well. Powerful films, very much so.